Thank you to Krusteaz® and T-fal® for sponsoring this glorious post about one of our favorite family meals: breakfast night! It’s the perfect way to celebrate Breakfast Month in February. Mmm… Eggs, bacon and waffles. It’s one of the most classic, all-time best breakfast (or breakfast for dinner) options out there. Light and fluffy waffles (a little crispy around the edges) are perfect for soaking in all the golden yellow yolky goodness of a perfectly cooked sunny-side-up fried egg, simply prepared with a T-fal frying pan, a little butter, salt and pepper. How can you go wrong with that salty, smoky, crunchy bacon bite?? 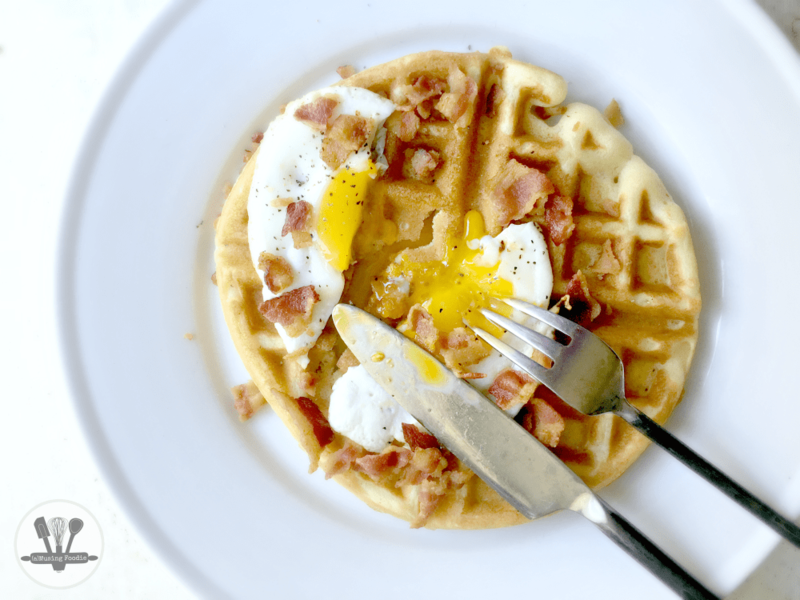 It’s the perfect savory accent to the mild vanilla sweetness of a Krusteaz waffle! Those of you who read regularly know that I often make waffles and pancakes from scratch. I’m happy, however, to try a boxed mix that allows for a different texture and flavor than my own recipe. And in the case of waffles, the box mix means I use less butter and fewer eggs—perfect when it’s nearing time for a grocery run, and I’m low on both! In honor of Breakfast Month, Krusteaz sent me a box full of their delicious mixes—everything from waffles and pancakes, to blueberry muffins and cinnamon crumb cake. And, to make the this February breakfast celebration even more fun, my gift box included kitchen gear like a whisk, pancake molds, a tote bag, and a pancake batter pen (my kids loved this). T-fal also added a frying pan to my loot … excellent for creating the perfect sunny-side-up egg. If you’re reading this going, “We love the idea of breakfast for dinner, but man. I’m feeling so uninspired,” then don’t worry! Good ol’ eggs, bacon and toast will always be a quick home run “brinner” in our house. That said, it can pay to be a little more creative, while still keeping things simple! This post was sponsored by Krusteaz and T-fal. All thoughts are my own! I like a ham and cheese omelet with has browns. Mmm…yes. Especially if the hash browns are nice and crispy! I like pancakes and sausage! I like pancakes and sausage!! Angela – Yum! Me, too! My family loves pancakes, bacon, eggs and hash browns! Sometimes we just do biscuits and gravy though and it is so filling! Lindsay – biscuits and sausage gravy is one of my faaaavorites. YUM! Reminds me of when I lived in Savannah, Ga., for a few years! I like egg burritos. They usually require more prep than I am willing to undertake in the mornings, so we eat them almost exclusively as a dinner food, when we have more time. David – that sounds delicious! What do you put in the egg burritos? I love to have pancakes for dinner! That sounds delicious! I’d go for sausage, myself! We love pancakes with bacon and fruit as breakfast for dinner! I like scrambled eggs, bacon, and a blueberry muffin for dessert! I like having waffles and sausage for dinner. I want to try your Spinach, Bacon, Egg and Cheese Casserole! We love breakfast casseroles, waffles, pancakes, omelettes, muffins, fresh fruit, etc. It’s so good reheated, too! The tater tots and sausage sounds appealing to me. Sorry I missed your giveaway. ANYTHING with sweet potatoes and I am there!! I could try making sweet potato hash brown waffles!